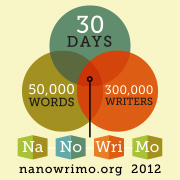 Every November is National Novel Writing Month, an opportunity to write a 50,000 word novel. Sponsored by the Office of Letters and Light, a California-based nonprofit organization which hosts some of the largest literary events in the world, it started in 1999 with 140 participants, and last year had over a quarter million participants in over 60 countries. You can also visit the official National Novel Writing Month page, as well as the Office of Letters and Light. They also have a Young Writers Program for kids and teens.